So it was Easter last weekend which meant that Friday and Monday were both bank holidays! For me this didn’t mean much as I’m still on maternity leave but it did mean hubby had two days off! I’ve been trying to write about the weekend all week but have been distracted – damn you Candy Crush!!! On Friday we went for our first walk as a fivesome. Hubby was going away to his friend’s wedding anniversary party. 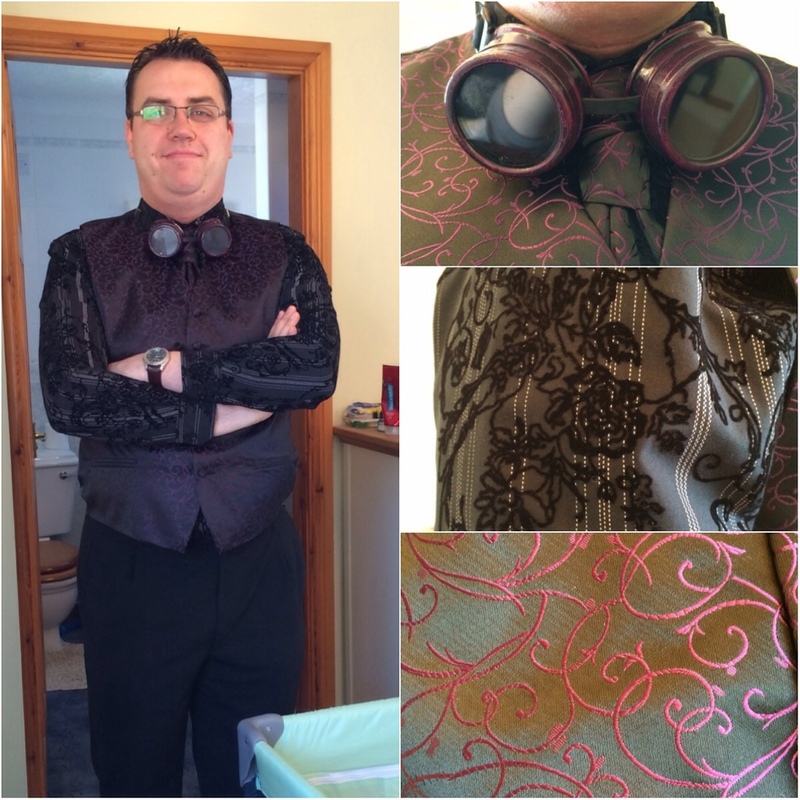 I think I mentioned it before but they’re having a steampunk themed party so hubby had bought a lovely waistcoat to wear. I made him get a purple one because most of my dresses are purple so he’ll be able to wear it again. I think the pattern is gorgeous! And it came with a cravat. Oh and of course he had bought some goggles to complete the outfit. So he left for the do at around 12pm. Ten minutes later I noticed that he as forgotten the card! I couldn’t find the prezzie so I phoned him to ask. He hadn’t gone too far so he turned back to come fetch. As it turns out he had the prezzie and should’ve just carried on! Here’s the prezzie. 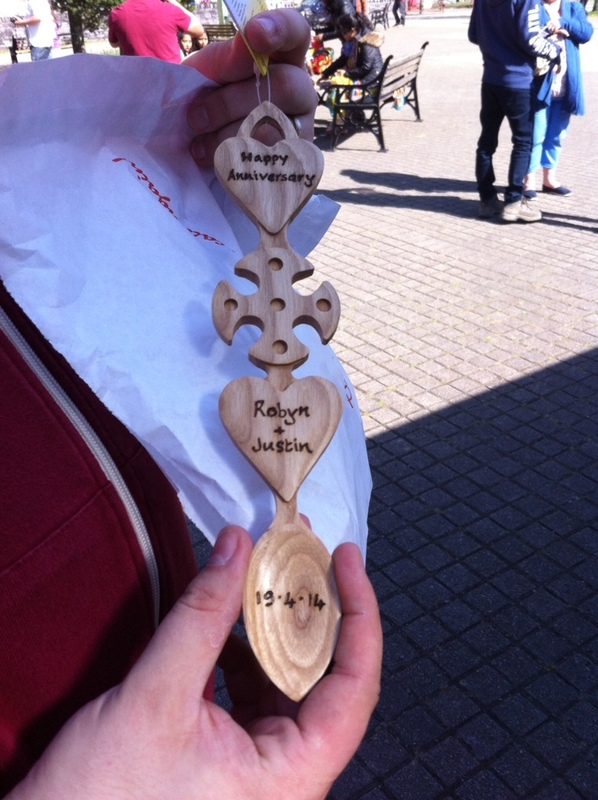 It’s a traditional Welsh love spoon. I must admit that I was rather worried about settling Little Miss on my own as she’s been super cranky around bedtime (6-7pm). So I thought we’d have a late night and put Beauty and The Beast on to watch. 10minutes in and she decided that she wanted to go “beis” – our word for bed. (It’s not Welsh it’s just baby lingo! I think it’s come from “beddy-byes” I.e. the “byes” bit but given a Welsh spelling). My evening was spent watching the end of Rush which I’ve been trying to watch for months! I didn’t like watching the quite graphic bits in front of Little Miss. I try to stick to cartoon and comedies when she’s with me. Little Miss woke quite early and so we got up and watched the F1 together. Hubby was back by lunchtime and we had thought about going up to my home town to visit but by the time I got a hold of Dad to see if he was home it got too late. So we didn’t bother and had a lazy day instead. Monday was Easter monday and so hubby had the day off. Another lazy day except hubby did mow the lawn again. It’s looking much better since mowing! We still haven’t been able to find anyone to do the garden as everyone keeps saying it’s a big job! Yes it is which is why we’re willing to pay someone to do it!! So that was the weekend – no Easter eggs!!! !